We had a most enjoyable evening on the 15th February 2017 when following our regular meeting, where we worked a Fellow Craft degree to pass an E.A., after which we were joined by eight gentlemen, who were interested in learning more about the membership of our Lodge and also by Mr David de Gernier, an ambassador for the charity MacMillan Cancer Support (Macmillan Cancer Nurses). 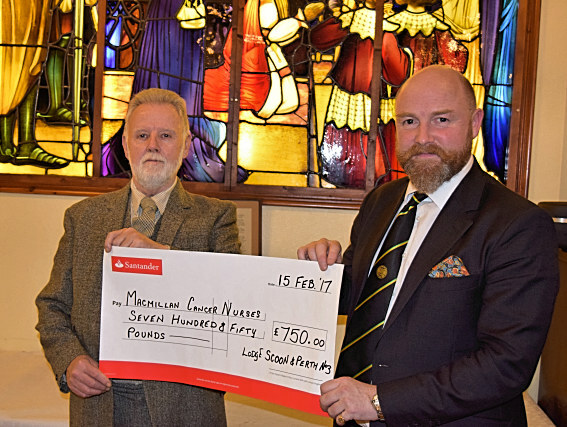 After a light supper our RWM, Brother Alexander Moncrieff, presented a cheque for £750.00 as a donation to Macmillan Cancer Support. Mr de Gernier thanked the Lodge for the donation and explained a little about the vital work the charity does for not only in giving nursing care for cancer patients but also the support they provide to the patient’s carers and family. After supper we were entertained in song by a member of the Lodge who accompanied himself self on the guitar.